In Ed Orgeron’s debut as the permanent coach, bet on the better defense and play the Tigers as 3-point favorites in the Buffalo Wild Wings Bowl. 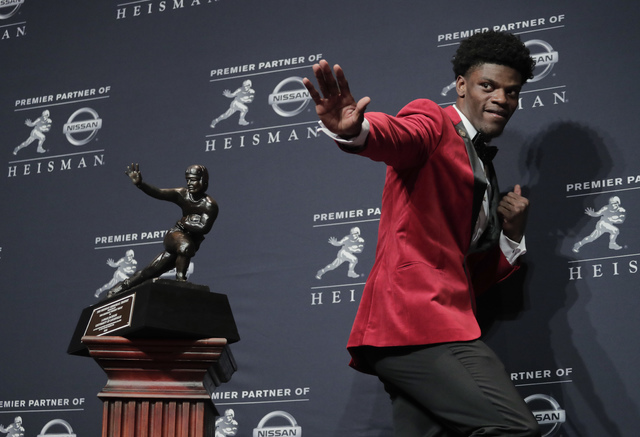 After limping to the finish line, Louisville will enter next week’s Buffalo Wild Wings Bowl with sophomore quarterback Lamar Jackson as a newly minted Heisman Trophy winner. Jackson has caught the eye of the Cardinals’ opponent, Louisiana State, which prides itself on playing hard-nosed Southeastern Conference-style defense. Standout cornerback Tre’Davious White told the media he and his Tigers teammates are not hoping for inclement weather Dec. 31 in Orlando, Florida. LSU star running back Leonard Fournette won’t play. But in Ed Orgeron’s debut as the permanent coach, bet on the better defense and play the Tigers as 3-point favorites. Vanderbilt (+4½) over North Carolina State — The Commodores displayed serious gains down the stretch, defeating Georgia, Mississippi and Tennessee in their final six games. Wake Forest (+12) over Temple — Should a team from the American Athletic Conference that has lost its coach be favored by double digits over a team from the Atlantic Coast Conference? Matt Ruhle left Temple for Baylor this month. Wake Forest is 14-6 against the spread in its past 20 games as a double-digit underdog. Georgia (-1) over Texas Christian — TCU’s performance was uneven all season. The Horned Frogs suffered from inconsistent quarterback play and uncharacteristically average defense. SEC East bowl favorites of fewer than 10 points are an impressive 17-8 ATS in their past 25. South Alabama (+13½) over Air Force — Although South Alabama did little in between, the Jaguars defeated Mississippi State and San Diego State during nonconference play. Air Force is 8-22 ATS as a double-digit favorite since the start of 2010. Michigan (-6½) over Florida State — Michigan’s defensive front seven is among the nation’s best and should abuse a Florida State offensive line that allowed sacks on 8 percent of the Seminoles’ pass plays to rank 104th in the nation. The Wolverines, meanwhile, had the highest sack percentage (12.5) in college football. Wisconsin (-7½) over Western Michigan — For all its positives, undefeated Western Michigan was vulnerable defending the run, as Northern Illinois (251 yards rushing/6 yards per carry) and Toledo (227 yards/7.6 ypc) racked up big numbers. Badgers tailback Corey Clement (1,304 rushing yards) must be licking his chops in anticipation. Southern California (-6½) over Penn State — Since redshirt freshman Sam Darnold took over as starting quarterback after a 1-2 start, Southern Cal has arguably played as well as any team in the country not named Alabama. The Trojans were clearly the better team in Seattle in mid-November when they beat playoff entry Washington. Auburn (+3) over Oklahoma — The Sooners’ gaudy offensive numbers were assembled against the mostly subpar defenses of the Big 12. Auburn, led by end Carl Lawson, boasts one of the nation’s top defenses. Paul Stone of VegasSportsAuthority.com is providing college football analysis for the Las Vegas Review-Journal. Follow @paulstonesports on Twitter.